A Testimony to Friendship Opens Doors in D.C.
Michael Britt, Peab '84, believes silent films should be seen -- and heard. That's why he has devoted a good portion of his professional life to playing the theatre organ and accompanying silent shorts and full-length movies. For the past 23 years, Britt has served as director of music and organist at the Shrine of the Little Flower in Baltimore. He is also on the music faculty at the Community College of Baltimore County at Catonsville, plays keyboard for Shades of Blue (a popular Big Band orchestra), and is a frequent recitalist. But the love of his life, he readily admits, is the theatre organ -- the most extravagant of pipe organs that was once the pride and joy of movie houses across this country. A child of the '60s, Britt is captivated by the silent film era. Although its heyday was short-lived -- about 15 years, until the first "talkie" in 1927 -- the experience of a silent movie with live musical accompaniment is timeless, according to Britt, and not to be missed. 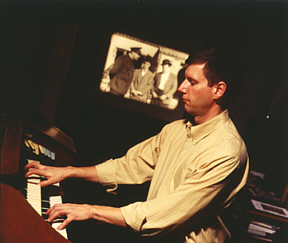 Britt practices at home on his 400-plus pipe theatre organ Britt loves to see children and adults immersed in the onscreen antics of Laurel and Hardy, Harold Lloyd, and Buster Keaton, his personal favorite. "It's rare to find a source of entertainment so intergenerational," he says. "I feel very fortunate to have had the opportunity to learn my craft and to now present it to a new generation." Britt's interest in the theatre organ began around age 10, when he penned a fan letter to a man hosting a private theatre organ concert in his Thurmont, Maryland, home. The letter earned young Britt and his mother an invitation to an upcoming concert. "As soon as I heard the organ, I knew that's what I wanted to do." Britt went home, turned on the cartoons, turned down the sound, and started playing along on his piano. In junior high, he persuaded teachers to allow him to accompany a screening of The Thief of Baghdad, Douglas Fairbanks' 1927 silent epic. "It was the longest 90 minutes of my life," he recalls, "but theatre organists learn by doing. The more you do it, the better you get at composing your own scores." A highly ranked and well-regarded Marine officer, Major General Clifford L. Stanley, SPSBE '77, is bringing his three decades of management experience to academia. Named last fall executive vice president at the University of Pennsylvania, Stanley is the university's chief operating officer. 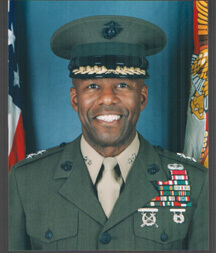 Stanley joined the Marine Corps in 1969 and earned progressively more senior command responsibilities. From 2000 to his departure for Penn, he served at Quantico, where he was the base commanding general responsible for training and education, planning, and concept development for the U.S. Marine Corps' active duty and reserve personnel. He was also the Marine Corps' Principal Representative to the Joint Requirements Board in support of the Chairman of the Joint Chiefs of Staff. "Cliff is a superb manager and strategic thinker with a natural ability to bring out the best in people," said Patrick Harker, dean of Penn's Wharton School. "I have known him since we both served as White House Fellows and have always been impressed by his energy and ability to motivate people." In the ancient Greek fable The Odyssey, Odysseus' men escape from the Cyclops by stabbing him in his one eye and hiding beneath the bellies of sheep. The woolly fleeces fool the blinded Cyclops and the men escape. Ancient Icelandic sagas are also rich with sheep references. And among many Biblical references, Christian believers are compared to "the sheep of (Christ's) pasture." Sheep, and the prominent role they play in literature and psychology, fascinate Harry Marcoplos, A&S '49, '58, who is also a strong advocate for the study of the classics. But Marcoplos' interest is more than academic. 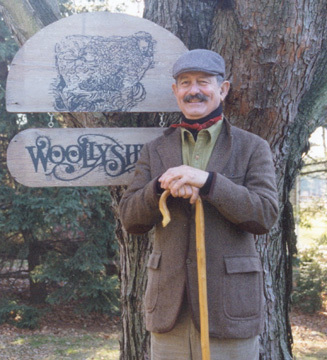 For almost 30 years, he has been a sheep farmer who supervises all aspects of the production of high-quality wool goods, from royal fleece to finished product. A former Hopkins lacrosse player, Marcoplos is also a three-time field hockey Olympian who coached the women's sport at Johns Hopkins for 20 years. You might say that, like sheep, Marcoplos has spent a fair amount of time outdoors in green pastures. "I'm an outdoor freak," he says. Marcoplos, at his Baltimore-area farm Marcoplos keeps some sheep on his farm outside Baltimore, but most of his sheep are cared for on a farm in the Maine countryside. After shearing, the wool is sent to New England knitters who produce high quality sweaters, hats, scarves, and even occasional specialty items (including fingerless gloves that allow avid golfers to comfortably play in cold weather). He's even won awards for an artistic, self-produced sheep calendar that inspired an appreciative letter from a fellow sheep fan, the sculptor Henry Moore. Marcoplos calls himself a "missionary for the use of wool" and says his close-knit (no pun intended) clan of knitters are people who share his passion. "One of my longtime knitters is a marine biologist and another is a triathlete -- they're people who just love to knit," he says. Sheep have much to teach us about human behavior, Marcoplos believes. "They have a lot of qualities we should emulate," he says. "They're patient, gentle, and clean." 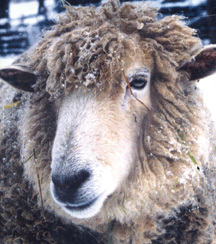 Sheep will always be an enduring interest for Marcoplos -- but as a business, he thinks it's time to hang up the shears. "It's quite a bit of work and I've been doing it a long time," he says. "I think it's time to move on to other things." Contemporary women can have it all -- a stimulating professional life and a close, fulfilling relationship with their kids and husbands -- provided both they and their mates are willing to make some compromises at work (in the form of reduced work schedules, flex time, etc. ), according to lawyer-turned-writer Shields. Enron: The Rise and Fall, by Loren Fox, A&S '89, John Wiley & Sons, (2003). Fox offers the first behind-the-scenes account of the "day-to-day machinations that gave Enron its power and fueled its demise." Both well researched and entertaining, Enron depicts what happens when a company is allowed -- encouraged, even -- to live well beyond its means. Henry the Steinway and the Piano Recital, by Sally Coveleski and Peter Goodrich, A&S '73, Bright Sky Press, (2002). When young Ana beings to despair before her first piano recital, trusty Steinway Henry comes to life to coach, reassure, and inspire her. A delight for kids and parents. The terminology -- music piracy -- conjures up images of swashbuckling desperados who scoff at legal restraints and relish bucking the "Establishment." But this particular brand of pirate could be your clean-cut neighbor, your roommate, or even you. With the click of a mouse, the Internet's MP3 format can easily be burned onto a CD or transferred to an MP3 player without paying a penny to the composers, recording artists, or record labels. This illegal but pervasive practice is thought to be particularly rampant on college campuses, where knowledge and skills intersect with technology access and, oftentimes, scarcity of disposable income. Is this practice an unavoidable supply-and-demand phenomenon, or is it blatantly illegal behavior that should be punished to the fullest extent of the law? Two alums offer their perspectives. To some, the day that Napster shut down free music downloads was akin to "the day the music died." Mourning was brief. Soon, a flurry of other free downloading sites popped up, and the prevailing attitude was one of defiance. This defiance is both legally and morally wrong, according to Eric Schwartz, A&S '79, an attorney with Smith & Metalitz, LLP, a legal firm that specializes in intellectual property law. Schwartz served as a copyright consultant to the attorneys who successfully challenged Napster and other music downloading sites. Many people don't realize what an important role copyright law plays in encouraging the proliferation of the arts, says Schwartz, a strong arts advocate who served as acting general counsel with the U.S. Copyright Office from 1988 to 1994. "Digital piracy is unequivocal theft and not at all funny to the thousands of musicians, composers, or record company employees who make their living on copyright," he says. "It's amazing to me how people who know it's wrong to stuff their pockets with CDs and walk out of a music store will think there's nothing wrong with downloading free music -- just because it's done in the privacy of a living room. I don't understand that moral logic." "Digital piracy is unequivocal theft and not at all funny to the thousands of musicians, composers, or record company employees who make their living on copyright," says Schwartz. He encourages music downloaders to consider the consequences. "In this country, the government doesn't significantly subsidize the arts, so copyright is that subsidy," he says. "People tend to think of the music industry as a big, greedy corporation, but you have to remember that [it] isn't a monolith. There are studios, musicians, composers, advertisers, producers, publishers, and the cost of developing new artists, including those who fail -- all of that has to be paid for. "Think of who you're hurting. The music companies will take a hit, but they'll survive. Already, labels are saving money by backing 'sure' hits and not developing new artists. The ones who might not survive are those on the periphery -- for example, the talented but unknown composer or recording artist whose only source of income has been obliterated." The scope of digital piracy worldwide is mind-boggling, says Schwartz, and encompasses CDs, CD-ROMs, and DVDs, often reproduced and distributed via large-scale organized crime networks in Eastern Europe or Asia. He sees it as a serious problem that will require some drastic steps, but "the idea that you can sue as a solution is silly," he says. "It has to be enforced with technological protection measures." Changes in worldwide copyright laws as the result of two 1996 international "digital treaties" are a start, says Schwartz, but much remains to be done. Imagine downloading a favorite tune off the Internet, and when you go to play it, instead of music, you hear static, or a message that says, "It is unlawful to violate copyright." This practice, called "spoofing," is one of the least invasive measures currently being considered by the music industry in order to prevent music piracy, says University of Texas/Dallas economics professor Stan Liebowitz, A&S '71, whose recently published book, Rethinking the Networked Economy, looks at the economic forces that drive the digital marketplace, including digital music. 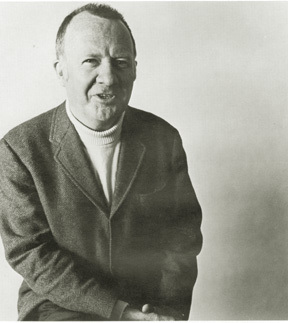 Liebowitz became the darling of downloading fans when he first criticized the music industry for claiming that downloading cut into profits. More drastic crackdown measures include singling out individuals among the millions who download and prosecuting them, and (if a measure pending in Congress passes) allowing copyright owners to technologically sabotage music downloading capabilities -- without liability, as long as no hard drive damage is done. The problem with crackdowns, says Liebowitz, is that they could result in public relations fiascos akin to what happened when the music industry attempted to collect royalties for songs that Girl Scouts sing around campfires. Liebowitz became the darling of downloading fans when he first criticized the music industry for claiming that downloading cut into profits. "Suddenly, I was getting calls from reporters at magazines like Fortune and Rolling Stone," says Liebowitz. He had previously sided with the record companies, but when he saw that the empirical evidence didn't match his theory, he revised his views. "I was a convert and they loved me." And he had history to back him up. Older copying technologies like cassette or VHS tapes had not crippled the entertainment industry, but instead, had eventually proven to be a boon. "The movie industry now generates more revenue off the sale of prerecorded movies than it does from theatrical releases," he explains. He stands by his criticism that the music industry failed to prove any harm in the Napster case, but says the industry turned out to be right anyway. After analyzing 30 years' worth of record sales data, he has now modified his position. "Claims about the effects of music piracy have been exaggerated," says Liebowitz, "but I can now say there is evidence that downloading is hurting the music industry. It's a sales decline that can't be attributed to the economy or other factors." Market forces are such that Liebowitz believes the recording industry should embrace Internet technology with pricing that reflects significantly lower Internet distribution costs. That's just beginning to happen. "Is this sweet, or what?" 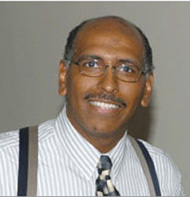 asked Michael S. Steele, A&S '81, in November, after being elected lieutenant governor of Maryland. Described as "one of the most promising leaders in the GOP," Steele was elected chairman of the Maryland State Republican Party in 2000, the first African American elected Republican state party chairman in the United States. He made history again on election night when he became the State's first African American lieutenant governor. His running mate, Robert Ehrlich, reversed a long losing streak for Republicans in Maryland, becoming the State's first Republican governor in more than three decades. A former Hopkins young trustee, Steele is founder of The Steele Group, a business and legal consulting firm specializing in Washington representation. He holds a law degree from Georgetown University and once studied for the priesthood. Scientists now have a better understanding of how bacteria communicate thanks to the work of Bonnie Bassler, A&S '90 (PhD), an associate professor of molecular biology at Princeton who has won a "genius grant" from the John D. and Catherine T. MacArthur Foundation. Bassler will receive $500,000 in "no strings attached" support over the next five years from the foundation. Bassler investigates quorum sensing, the chemical signaling mechanisms bacteria use to communicate. An understanding of quorum sensing could pave the way for the development of new antibacterial drugs. 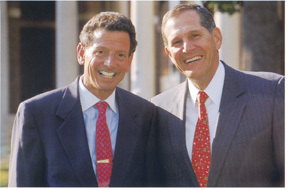 Morris W. Offit, and David H. Bernstein, both A&S '57, first met in Baltimore when they were about 12 years old. "Do you want to go out and meet some girls?" Bernstein immediately asked Offit. Duly impressed, Offit reports that he eagerly followed his newfound friend around the neighborhood as they knocked on door after door. But no one answered. "To this day, I call David a fraud," jokes Offit. Bernstein has a quick retort. "He married one of those nice young ladies from my neighborhood," says Bernstein. It was the beginning of a lifelong friendship that has included mutual support for Johns Hopkins and the gift of a strategically located building in Washington, D.C., to house programs of the Krieger School of Arts and Sciences and other university divisions. David Bernstein (left) and Morris Offit The Bernstein-Offit Building, dedicated this fall, is located at 1717 Massachusetts Avenue, N.W., near Dupont Circle and across the street from the Hopkins' Nitze School of Advanced International Studies. Currently, the building houses the Krieger School's Center for the Study of American Government and its advanced academic programs for part-time graduate students, the new Genetics and Public Policy Center of the Baltimore-based Phoebe R. Berman Bioethics Institute, and the Nitze School's Center for Transatlantic Relations. The Krieger School is exploring the possibility of two residential programs for undergraduates that would be taught in the building. One program would be in government and the other would involve the study of cultural institutions and the humanities, both providing a semester-long internship as well as course work. "The Bernstein-Offit Building expands opportunities for collaboration among our academic divisions and with the political organizations, embassies, think-tanks, and other agencies that make Washington the world capital that it is," says University President William R. Brody. "The benefit to our mission and to our students and our faculty is incalculable." As a senior writer and producer at The Food Network, Liza Klein Hughes, A&S '87, finds that her work life centers on food, glorious food -- namely food-related shows and promotions. Her efforts seem to be paying off. The network is a rising star in the cable market, boasting a 24 percent increase in ratings between 2000 and 2001. 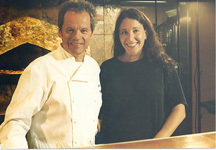 Hughes, with Wolfgang Puck Hughes has created promotions for the Emeril Salutes America sweepstakes and the Seasons Eatings December 2002 campaign, and has worked with some amazing chefs such as Wolfgang Puck, Bobby Flay, Mario Batali, and "Iron Chef" Masaharu Morimoto. What do alumni want? That's the burning question every fall when the 158 members of the volunteer Alumni Council, from all eight Johns Hopkins divisions, meet at Leadership Weekend to discuss issues and programs of interest to alumni. Among the issues discussed at this year's meeting were alumni involvement with students, international outreach, and the creation of new career tools and networking opportunities. Not everyone knows that the Alumni Association provides about $40,000 a year to student organizations. "Students really are a focus of the Alumni Association," says President Joseph R. Reynolds, the co-founder and chairman emeritus of Forensic Technologies, Inc. (FTI Consulting). "Personally, it's been my contact with students that has been the most thrilling part of my continued association with Johns Hopkins," he says. "Students are the heart of our university, and it's our job to encourage, support, and mentor them. If we can perpetuate student involvement with the university both before and after graduation, it can only add to the vitality of the Alumni Association." Projects supported in the past year ranged from the 2002 Spring Fair to marketing and publicity for a Symposium on Foreign Affairs, and support for the student-run Milton S. Eisenhower (MSE) Symposium. 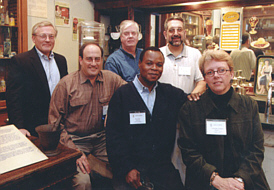 The officers of the Johns Hopkins Alumni Council include (l to r): president Joseph R. Reynolds, Engr '69; vice president David P. Yaffe, A&S '74; vice president James A. Miller, A&S '64; first vice president Roderich M. Carr, Engr '78; treasurer Paul A. Matlin, Peab '70, SPSBE '81, Engr '84; and secretary Christine R. Schmitz, Peab '75. Community service projects that involve students are also a focus of the Alumni Association. The association has provided financial support for a local elementary school orchestra, as well as for student achievement and mentoring programs. "We have a strong alumni base, and we see ourselves as a conduit to bring people together and build the Hopkins community," says Morgan State University professor Charles T. Johnson-Bey, Engr '89, who chaired the Council's Networking/Career Services committee. "One way to do that is by offering more networking and career services." This past year, the Networking and Career Services Committee focused on the addition of an Internet-based tool that offers career services and products. CareerTools -- available at alumni.jhu.edu -- helps alumni find new jobs, research career benefits and challenges, and improve their marketability. "In addition, the Alumni Association hopes to provide more career counseling, support, referrals, mentors, and networking opportunities for both students and alumni who want to change jobs or careers," says Reynolds. With campuses in Europe, Asia, and North America, ongoing research on all seven continents, and alumni in nearly every country on the planet, Johns Hopkins is truly an international university. In the past two years, the Council has increased its international activity and plans for future expansion of clubs and programs. Alumni who would like to get involved can contact the Alumni Association at: 800-548-5481. The Alumni Association is debuting a new graphic identity for its mailings and publications. Members of the Alumni Council's Marketing/Communication Committee worked with Adam Shanosky and Associates of Baltimore to create and implement the new look and logo. The design uses Hopkins' academic colors of old gold and sable and the University seal. It was the spring of 1970 and, while revolution might not have been in the air, a certain amount of tension was, even amid the placid confines of the Homewood campus. The focus for a few days that April -- weeks before the war in Vietnam spread into Cambodia, causing campuses to erupt nationwide -- was on the Baltimore police search for Black Panthers wanted for a police shooting. Hopkins students and faculty joined others in gathering before the Panthers' headquarters on Gay Street. "We were trying to see that there wasn't a shootout as there had been in Chicago," says Chester Wickwire, the longtime Hopkins chaplain, referring to the death of Chicago Panther leader Fred Hampton in a police raid the year before. Wickwire, in 1969 Then a deal was reached. The wanted Panthers would surrender, but only to one person -- Wickwire -- who would then see that they were safely handed over to the police. To many at Hopkins, it was an odd juxtaposition: the Panthers with their carefully-crafted tough image surrendering to this kindly, soft-spoken man who leaned on a crutch due to a bout with polio. But Wickwire took the heavily-armed Panthers in stride. "I know they were carrying guns, but that didn't surprise me much because I came from a gun culture in Colorado. I grew up thinking everybody slept on a .38." Memories of those days were concentrated in the Stony Run Friends Meeting House last spring. The occasion was a memorial service for Ric Pfeffer, who brought his charismatic radicalism to Johns Hopkins in 1969 when he joined the political science department. Pfeffer, who left the school in a tenure dispute a decade later and went to work as a lawyer in the Labor Department, died of prostate cancer at 65. Wickwire presided at the ceremony, appropriate since his quiet strength often stood behind the fiery rhetoric of Pfeffer. Wickwire always seemed to be the calm center at the eye of that era's storm, with a face given easier to a smile than a scowl. Levering Hall was Wickwire's campus home. He had come there fresh out of Yale Divinity School in 1953 to run the Hopkins YMCA operation, remained as its programs passed to university control in 1969, retiring in 1984. For many he is remembered for those few years when the civil rights movement and the Vietnam War thrust him into the limelight, a ubiquitous presence at rallies and demonstrations. The wildly decorated coffee house atop Levering was known as Chester's Place. But for Wickwire, those years do not stand out. They are part of a continuum in his life at Hopkins that started with the fight against McCarthyism (which erupted in the controversy over faculty member Owen Lattimore). It went through the civil rights years when Wickwire faced censure for sponsoring jazz concerts that would attract a mixed-race audience -- considered a dangerous practice in the Baltimore of 40 years ago. There was the Vietnam War and the focus it brought on student discontent, but when it ended, Wickwire kept going -- to Central America to oppose right wing death squads, to the Soviet Union to speak for Jewish dissidents, to the Eastern Shore to work on behalf of migrant laborers. And there is the lasting legacy of the tutoring program, over 40 years old and still going strong. Chester's Place is long closed, but its colorful murals by Bob Heironimus now look down on tutors and their young students. "One of the things I am proud of at least having tried to do is to relate the campus to the city," he says. Wickwire still speaks with the same combination of impishness and self-deprecation familiar to all who passed through Levering Hall during his time there. He is about to turn 89. A broken hip means he spends most of his time in a wheelchair. He and his wife Mary Anne are looking to move out of their Ruxton home -- that they bought when it was in the country -- to a retirement community. "We celebrated our 65th anniversary this summer," he says. "That's a fairly long time." They have three sons, four grandchildren, and four great grandchildren. He is particularly proud of his son Brian who works in a public health clinic in Texas on the Mexican border. "He is very idealistic," he says. "I know I'm damned lucky. There are still things I like to do." Currently, there is poetry: two books out, working on a third. Wickwire pauses. "It's the most technologically advanced classroom space here." "Even with all the technology, Hodson is a warm and congenial classroom building." These are just some of the accolades heard from students and faculty about Homewood's new Hodson Hall, dedicated this fall. The 44,200-square-foot, $15 million facility holds nine classrooms, three lecture halls, and a 500-seat auditorium -- all bursting with high-tech amenities. Standard room specs include tiered seating, a JBL sound system, data and power ports installed on all chairs, and wireless Internet access. Users have access to single- or dual-projection screens, CD/DVD players, VCRs, document cameras, slide-to-video convertors, and dual-audio cassette decks. Window blinds and lights can be adjusted with the touch of a finger. 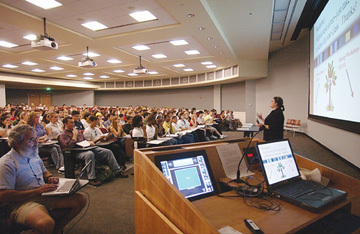 Hodson Hall allows professors to project high quality slide images, show multimedia files and simulations, access supplemental materials directly from the Web, and even conduct virtual laboratory exercises during class, all from an easy-to-use touch-screen podium. "When you talk to students who have classes here, you hear words like 'awesome' and 'fantastic,'" University President William R. Brody said at the dedication. "The praise is not just for the technology-rich environment, but for the overall ambiance and all the extra amenities that make this building so special. Our students love the study areas located organically throughout the building and out on the terrace. They love the huge windows that flood the classrooms with light. And they love the comfortable chairs and especially, they tell us, the ones that swivel... This building sets a new standard for our academic buildings." The building was made possible by a gift from The Hodson Trust, established in 1920 by the family of Beneficial Corporation founder Col. Clarence Hodson. Trust Chairman Finn M.W. Caspersen singled out three things that excite the members of The Hodson Trust Board about the new building: "the pure technology"; the permanent home it provides for the Beneficial and Hodson Trust archives, which "will be a research resource for academic scholars"; and the educational opportunities it offers. "The Hodson Trust believes firmly and completely in the value of education," he said. "It makes a crucial difference to the individual, to the United States, and to the world." The Hodson Trust has given more than $132.5 million to Johns Hopkins and three other Maryland institutes of higher education over nearly seven decades. Complementing the building is the new Center for Educational Resources (CER) located in the Milton S. Eisenhower Library and initially funded by The Hodson Trust. Through the CER, faculty consult with instructional designers and information technology specialists to craft new approaches to teaching and learning in projects ranging from the humanities and social sciences to natural sciences and engineering. Caspersen recalled a discussion in the 1970s, after he took over as chairman of the Trust, with then Hopkins president Steve Muller about what it would take to make Johns Hopkins one of a handful of top universities in the nation. "We laid out a plan ... and the Trust, along with many other donors, helped to make it happen," said Caspersen. "Today, Johns Hopkins is there." The unlikely partnership of Alfred Blalock, a renowned white surgeon, and Vivien Thomas, a black research technician with a genius for surgery, is the subject of an inspiring documentary feature that will air as part of the PBS television series American Experience. Narrated by Morgan Freeman, and featuring many Hopkins surgeons, Partners of the Heart will air in most cities at 9 p.m. on Monday, Feb. 10. Working together first at Vanderbilt University and then at Johns Hopkins, Blalock and Thomas helped create modern heart surgery and pioneered, with pediatric cardiologist Helen Taussig, one of the century's major medical breakthroughs -- a daring heart operation that saved thousands of children affllicted with a congenital heart defect called "Blue Baby Syndrome." Blalock was a southern patrician with revolutionary ideas for new treatments. Thomas was a gifted technician who possessed the intelligence and dexterity to translate Blalock's vision into reality. 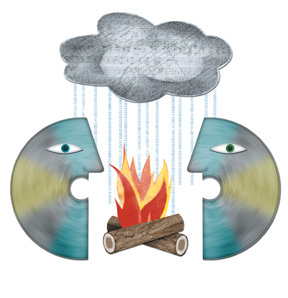 Together, they forged a powerful team that changed the course of medical history. Thomas was eventually given an honorary Hopkins degree and, along with Blalock, he helped to train two generations of America's most prominent heart surgeons. The documentary, funded by the National Endowment for the Humanities and the Corporation for Public Broadcasting, is described as "a story of broken racial barriers and an uncommon intellectual synergy; a story of two men who came together in an unlikely time and place to leave the world a life-saving legacy." The film is part of an educational outreach effort funded by GlaxoSmithKline for schools and communities that can be further explored online at www.partnersoftheheart.com. William F. Ward Jr., Engr '67, is CEO of Ward Machinery near Baltimore, a company founded by his father, which has been a generous supporter of Johns Hopkins. A Hopkins trustee, Ward serves as chair of the Whiting School of Engineering's National Advisory Council and is co-chairing the School's current campaign. Theodore O. Poehler Jr., Engr '56, '58, '61 (PhD), a materials scientist, is Hopkins' vice provost for research, responsible for research policy, coordination, and commercialization. In 1996, he and a Hopkins colleague developed an all-plastic battery, acclaimed as a materials breakthrough, using polymers in place of conventional electrode materials. Hugo Victor Rizzoli, A&S '36, Med '40, a retired Washington, D.C., neurosurgeon, served as chief of the Department of Neurosurgery at Emergency Hospital and chairman of the Department of Neurological Surgery at George Washington University. He has received many honors, has published extensively, and has worked tirelessly with the Veterans Administration.